I had one that said Flint-Cars, Bars and a few Weirdos. Can't remember the artists name, he had a cartoon series as well that dealt with the absurdist nature of live in the rust belt. I have a sweatshirt that says "Carp, not just for breakfast anymore." 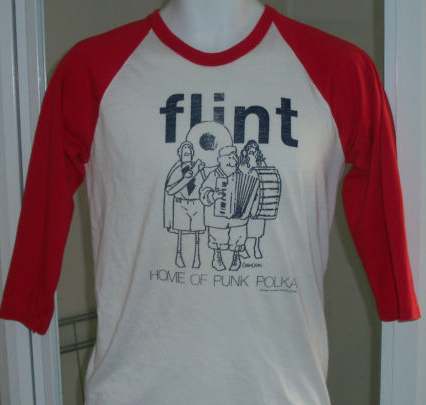 And I have the Flint weirdos shirt as well. The cartoons were drawn by an artist named Guindon (I believe that's his correct spelling). 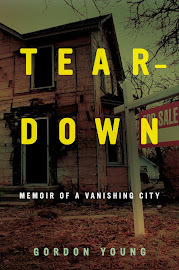 He was featured in the Flint Journal and I think either the Detroit News or Free Press. Tons of fun! Richard Guindon. Mucho info available via Google search. I knew I knew that hand, but I hadn't succeeded in tieing it to a name. He did a lot of Michigan-related cartoons. One favorite I remember was of people standing around at a party pointing at their hands. "Michigan people explaining where they live." He also had one of a car and a guy shoveling salt on to it. "To save money and reduce wear on the roads, the Detroit DPW is requesting that residents bring their cars in to have it applied directly." I actually used to have (may still have somewhere) a "punk polka" shirt. It was from the early eighties, I think.